To be absolutely certain that your pork has been ethically produced to a high standard, you really can’t beat raising a couple of pigs yourself if you have the land. 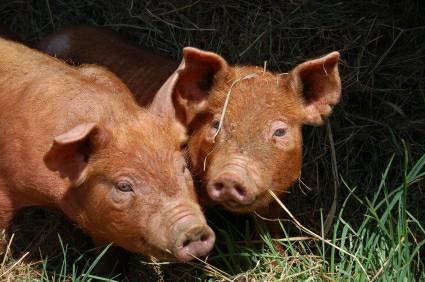 If you are lucky enough to have land of your own then rearing a couple of traditional or rare breed weaner pigs for your own meat is enjoyable, educational and ethically fulfilling. A weaner pig is a piglet approximately 8 weeks age and just off suckling its mother. When your pig has achieved the right weight, usually around 6 or 7 months old depending on the breed and individuals it’s time to take them for slaughter. This will have to be undertaken at a licensed abattoir but try to select a small family abattoir / butcher where you can take them easily to appointment. This avoids the animal being stressed by lairage waiting. Stress not only upsets the animal but also results in undesirable stress-induced chemicals being deposited in the tissues which will affect the taste and tenderness. Don’t just have one pig, though. They are highly-intelligent and social animals who do better in groups or a pair and need the company of their own species. You’ll need to provide your pigs with warm and dry housing with ample straw bedding to burrow under for their warmth and they need cool damp or watery wallows and shade in hot weather to keep cool. They’ll need to be able to freely roam in fenced pasture or scrub land. You’ll also need to supplement their scavenging each day with essential additional bought in high protein pig feed. You can feed them all those garden vegetable throw aways but you cannot feed them on waste food. There are strict rules in place to prevent the development and spread of disease. As we are so closely related to pigs their diseases can be easily transported and transmitted on our skin, hair and of course clothing! The days of pig-swill bins at school are gone. There is paperwork to be done and licences to be obtained as well before you can keep pigs or even move them. Make sure you are properly informed about keeping pigs before you acquire them. A good book is invaluable as a reference and book yourself onto a course about pig keeping tutored by someone suitably experienced to gain both practical hands on and technical training.